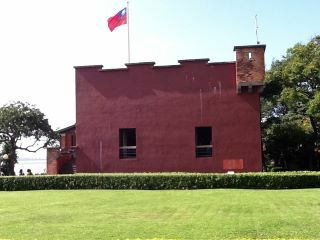 Al llegar a Taiwan, nos hemos dado cuenta que no fuimos los primeros.El Fuerte Santo Domingo fue construido en 1626 por los españoles. Fue el primer asentamiento europeo. Pronto habrá una botellita de Enguera en lo alto. In Taiwan, we have realised that we were not the first ones to arrive. Santo Domingo Fortress was the First European settlement, built up in 1626 by some crazy Spaniards. Later on, the Dutch and the English took it over. I am sure we will take it back, with no violence, but with wine. This entry was posted on 28 noviembre 2011 at 2:24 pm and is filed under Uncategorized. You can follow any responses to this entry through the RSS 2.0 feed. Responses are currently closed, but you can trackback from your own site.